BERLIN - Chancellor Angela Merkel on Sunday vowed to work with the Social Democrats for the "good of Germany" as the center-left party agreed to join her new coalition, but the veteran leader will go into her fourth term with weaker cards than before. 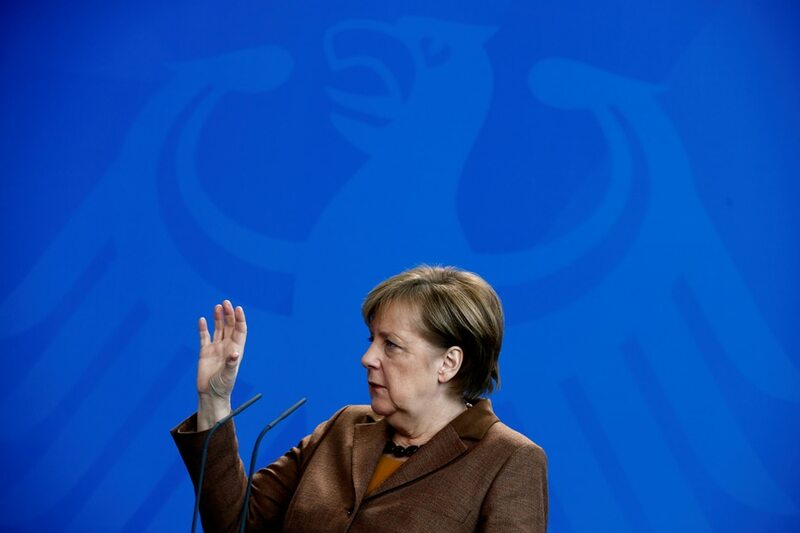 Two in 3 of the SPD's rank and file voting in a crunch referendum backed a new partnership with Merkel's conservatives, heralding an end to the political stalemate that has plagued Europe's biggest economy since September's inconclusive elections. But the chancellor, in power for 12 years, has had to pay a high price to coax the reluctant Social Democratic Party (SPD) back into another loveless "grand coalition". Congratulating the SPD for its "clear result", Merkel said she was looking forward to "further cooperation for the good of our country," according to a tweet attributed to her on her CDU party's account. Stung by their worst post-war results, the SPD had initially ruled out another four years in Merkel's shadow. "We now have clarity. The SPD will be in the next government," said SPD's caretaker chairman Olaf Scholz, adding his party plans to send three male and three female ministers to the cabinet. European partners waiting impatiently for Germany to end its longest stretch of coalition haggling since the end of the war heaved a sigh of relief, with French President Emmanuel Macron calling the SPD decision "good news for Europe." In a nod to the "GroKo", as the grand right-left coalition is known in Germany, European Commission vice president Frans Timmermans wrote on Twitter: "GroGO! For solidarity in Germany and EU!" Merkel is due to be re-elected by parliament as chancellor on March 14, said Volker Kauder, parliamentary chief of her CDU party. But the long-serving leader faces a far rockier road ahead. A crushing majority enjoyed by her conservatives and the SPD in the last coalition has been trimmed to a slim 56 percent of seats (399 out of total 709) in parliament this time round. The AfD, which would be the biggest opposition party in Germany as the SPD joins the government, vowed to go after Merkel's CDU over its "continuation of the immigration policy without imposing a limit." The party's parliamentary group leader Alice Weidel predicted that "the bill will come at the latest in 2021." Wary of ceding further ground to the far-right Islamophobic outfit, Merkel's conservatives and the SPD have agreed to review their cooperation in two years. The SPD's youth chief Kevin Kuehnert, who ran an impassioned campaign against the planned coalition expressed disappointment at Sunday's vote result. "When criticism is necessary, then it will come from us," he vowed, adding that young Social Democrats won't rest until there is a "fundamental renewal" in the party. The tension within the party over its partnership with Merkel was illustrated by the silence that met news that the "Yes"-camp prevailed, prompting Spiegel Online to headline its story "Hardly any rejoicing". Sueddeutsche daily noted that "she is the one who has made it clear that the CDU is now no longer without a successor for Merkel".